It’s less than an hour’s drive east on the I-80 to reach Cheyenne from Laramie. But after climbing steeply out of Laramie to the Lincoln Monument (at 8,640 feet the highest point on this interstate), it’s well worth taking the quiet, parallel Highway 210 (Happy Jack Road). It traverses high rangeland dotted with fantastic red Sherman granite boulders, an area known as Vedauwoo (vi-de-vu) and frequented by climbers. Just beyond are a couple of high-plains lakes in Curt Gowdy State Park, named after the famous sportscaster. Cheyenne is by far the biggest city in Wyoming (the Air Force base helps), it’s the state capital and it boasts a major rodeo during its Frontier Days. So, to the victor goes the spoils, at least architecturally speaking. The wide downtown streets are nicer, the historic buildings better maintained and the surrounding residential streets more prosperous than, say, nearby Laramie. 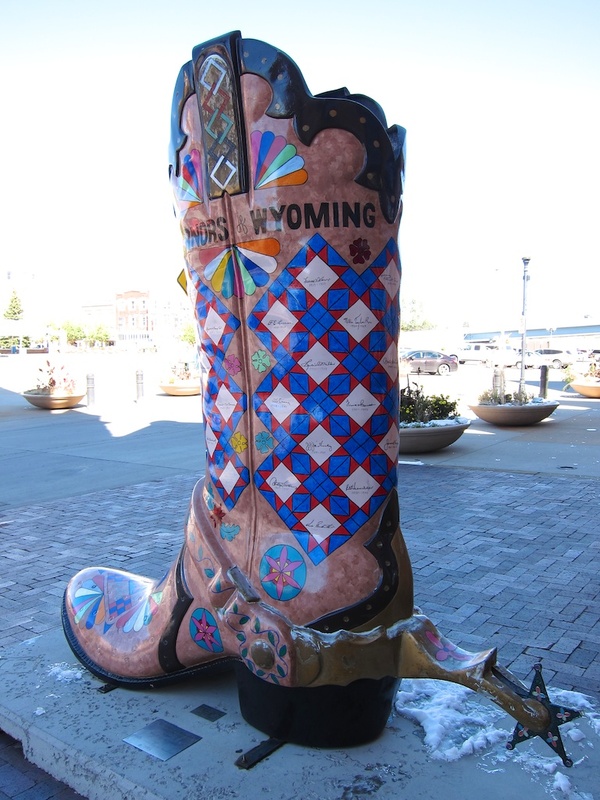 It’s worth getting a brochure at the downtown visitor centre and tracking down some or all of the 19 eight-foot-high cowboy boots, creatively painted by local artists and scattered around town. The city’s culinary choices may not be quite as inspired, but there are a few places definitely worth seeking out. If you want a Cheyenne place that oozes character, you’ve got to eat at *Luxury Diner, housed in an 1896 city trolley car. Entering, you walk down a narrow black-and-white checkered floor, past walls filled with train photos and twinkling Christmas lights to reach your table, where the welcoming, longtime waitress calls you “Dear”. A healthy appetite is needed to tackle the excellent all-day breakfasts and burgers that envelop the quickly arriving plates. I’ve already tucked into my substantial, crispy chicken-fried steak with gravy when a regular at a neighbouring table leans over to extoll the virtues of the homemade corned beef and the trout and eggs “that are to die for.” Still alive after lunch and a brisk, calorie-burning jog, I return in late afternoon for a first-class, half-pound burger blanketed in melted cheese, bacon, mushrooms and grilled onions, accompanied by hot potato wedges. I think another run is in order. 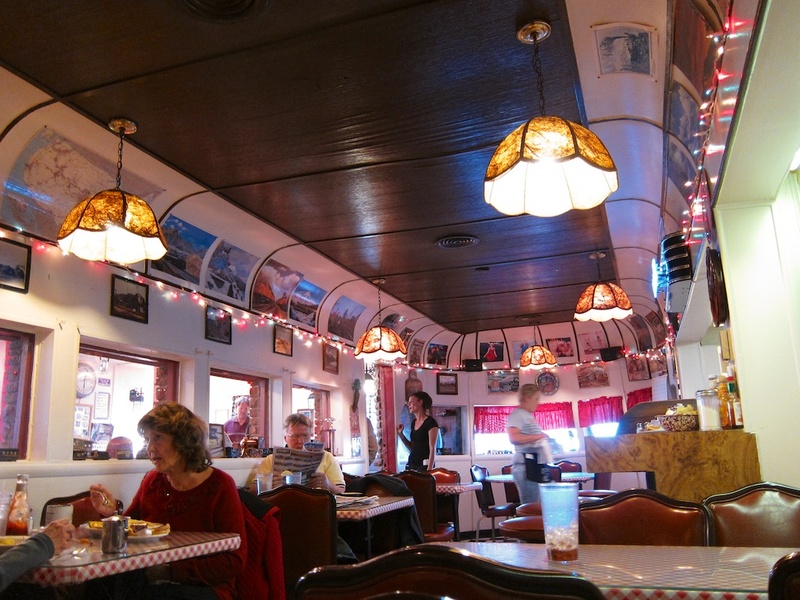 The Luxury Diner, in Cheyenne Wyoming, serves excellent meals in a charming old trolley car. The decor at R & B Breakfast Club is all Elvis, from the wall-festooned photos and artwork to the tabletop collages; maybe the blue walls are even a tribute to suede shoes? 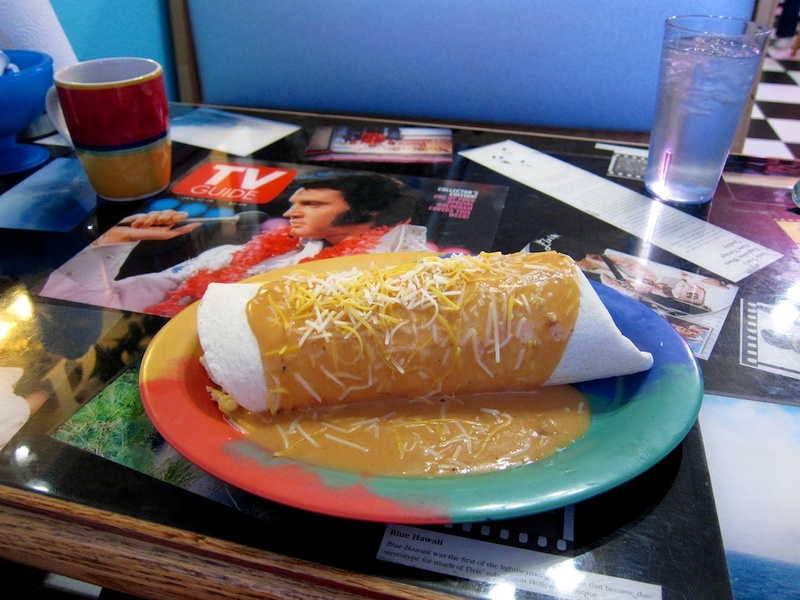 The diner’s other claim to fame is its breakfast burritos, which (big surprise) are stuffed to near overflowing with eggs, sausage, cheese and hash browns and then drowned in red chile—my morning taste buds aren’t ready to be ignited with the spicier green. The delivery is hasty, the burrito tasty. My only complaint is the lukewarm temperature, which the waitress quickly remedies with a quick heating in the microwave. Not far away, The Bread Basket churns out a lot of baked products, from house-ground whole grain breads to sticky buns and muffins. These breads are the foundation of good half and full sandwiches and an interesting cabbage burger, which includes onions and hamburger meat wrapped in bread and then baked. This entry was posted in Cheyenne, Restaurants, Road trip food, Travel and tagged cheyenne, restaurants on January 30, 2013 by bcorbett907. Perfect! I’ve never found anything in Cheyenne but the “Texas Roadhouse”. 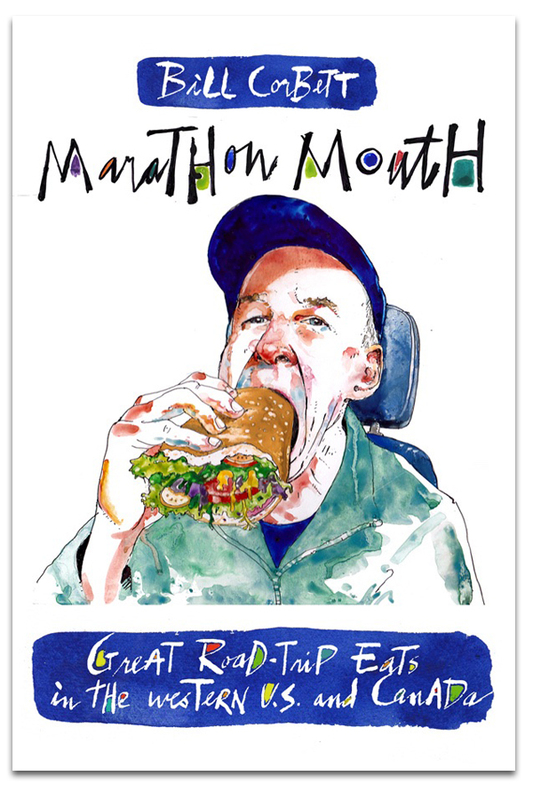 Nice work, Bill!